ChatNow: The ChatNow two-way radio communicator is the new personal communicator that allow kids to ‘call’ or ‘text’ their friends. With the digital camera kids can take and store up to 30 images that can be viewed on the unit’s black-and-white screen. Why do I blog this? I am looking at interface for kids (because of various projects for video game companies that target kids users). What I like in those phones is that they are not fully featured handsets (for instance calls can be limited to a set of numbers provided by the parent or some other features are missing). 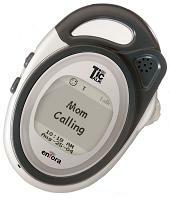 Either there are some interesting add-ons like the possiblity for children to make their own ringtones with the Leapfrog phone as well as the existence of five games on the phone, teaching math, spelling and social-science skills. Parents can also reward children with phone minutes for reaching certain levels in the games and they can set "quiet" times for the phone, for instance during school hours (as mentioned in this article in the WSJ). "The network is the church"